Mama Dogs Don’t Use Treats….. Many people seem enamoured with the idea that we should emulate what dogs do in the wild. “Mama dogs don’t give treats in the wild,” is one of the more common expressions. This one carries quite a punch. People have a natural affinity for natural. An expression is only valid if it holds up under scrutiny. Look for holes. This one is as holey as Swiss cheese. Truth is, mama dogs don’t use shock collars, choke collars, say “tsssk” or “eh eh eh” either. Switching from “unnatural” food to leash corrections and shock collars is moving from one unnatural thing to another unnatural thing. No training technique is “natural” because obedience is not natural. Nature is cruel. Emulating nature is to aspire to a system of survive or die. Find food or die. Avoid predators or die. Find shelter or die. Be fearful enough to avoid moving cars or die. Nature is more than cruel, it’s damn cruel. Emulating nature is emulating a life of peril. Female dogs birth, feed and wean puppies. Male dogs offer little to no paternal care. They’re promiscuous, breeding with multiple females. If they were human, we would call them cheating deadbeat dads. Pups quickly mature and become pregnant as early as five months of age. 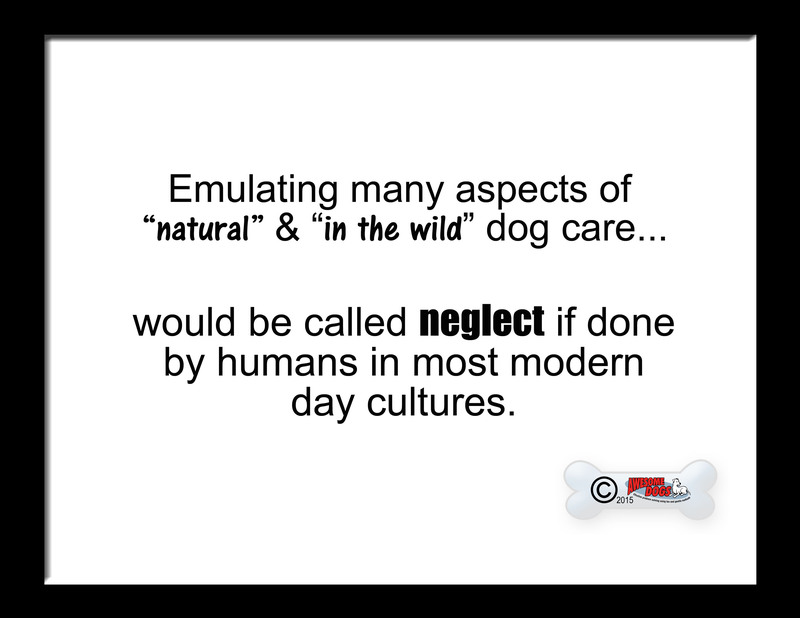 Emulating natural dog care would be called neglect in most modern human cultures. Let me repeat, nature is cruel. Dogs might not use food to teach obedience, but all animals learn with food, even in the wild. Let’s look at a couple examples. Imagine it’s garbage day. After much pawing and fussing, the dog manages to open the latch on a garbage bin. After opening the container, the dog finds food inside. Obtaining food reinforces the dog’s biting and pawing behaviours. With repetition the dog becomes proficient at latch opening behaviour. Food continues to reinforce latch opening behaviour. It’s a behaviour that my Kip has taught himself with significant proficiency. Let’s say that the dog hears people as they drag the bins to the curb. The banging and clanging scares the dog. As the street becomes quiet, the dog notices streets lined with food refuse filled bins. With repetition, the dog learns that the noise predicts a boatload of food. An association forms between the noise and the food in the garbage bins. The banging and clanging is no longer scary. It’s straight forward classical counterconditioning. The ability to find, obtain and retain food is a necessary skill. Learning that certain people, places and things predict food – lead us to more food. Reinforcement with food and classical conditioning are the ways all animals learn whether in the wild or in a home. Food is as real world as it gets. Food is really darn functional. There is no segregation or difference between food and real life reinforcements. Food is a real life reinforcement. We are born with a need, desire and love of food. It keeps us alive. Food is nourishing, good and pleasurable – or at least it should be. We’re not feeding cupcakes to dogs. It’s a bit of meat or cheese – a yummy part of a balanced diet if offered with a dose of common sense. Despite a dog’s need and love of food, people become worried. “When can we wean off the food?” Technically, dogs wean off food when they’re dead. That is also natural. Perhaps we should ask instead, “When will you wean off that toy? 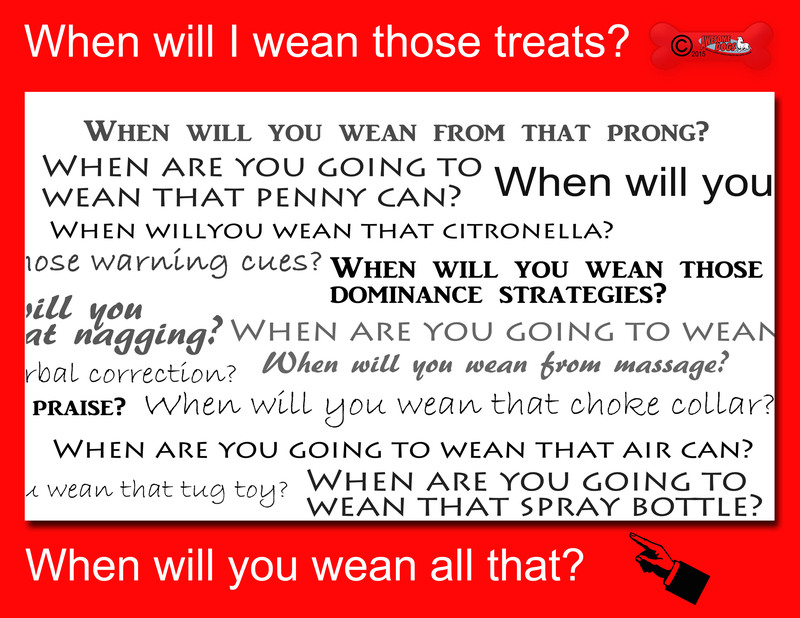 When will you wean off massage? When will you wean your dog off that warning signal that says a correction is possible? When are you going to wean off that prong collar?” No one seems too concerned about weaning away from anything BUT food. It’s an interesting commentary on how we view food. If “natural” is important to you when choosing a training technique, food is very much a natural way of learning. It’s one things that lends itself exceptionally well toward positive reinforcement and classical counterconditioning. Food is a renewable reinforcement. By that I mean that tomorrow the dog will want to eat again, and the next day and the next day. Dogs are scavengers. They’ll eat even when they have just eaten. There is no need to starve dogs in order to use food. They’ll eat garbage. Although I’d suggest using the less natural, “dog treat” instead of rotting compost for training. Be sure to balance their caloric intake with other unnatural things – on leash walks, agility sessions, dog sports and activities for exercise. The takeaway for owners is that this industry is full of little expressions and idioms. They’re designed to persuade and influence you one way or another. It’s not necessarily the most honest way of presenting information. A long-winded narrative that illustrates the ugly of living in the wild might not be pleasant to read. It is bluntly honest about what natural, function and “in the wild” means. It’s one thing to seek out elements of an animal’s natural habitat that bring it joy or increase welfare. Give dogs bones. They love to chew. Let them stop and sniff some pee mail occasionally. It’s an entirely different thing to look for harsh live or die examples to justify adding more adversity into a dog’s life so we can call it training under the guise of it being natural. Yvette Van Veen PCT-A is dog behavior consultant and owner of Awesome Dogs, in Dorchester, Ontario, Canada. She is also a long-time columnist and multiple Dog Writers Association of America award nominee, and currently writes a regular column for The Toronto Star. She has worked with rescue dogs for more than 14 years, focusing mainly on rural, roaming and feral rescue dogs from communities throughout Ontario and Quebec, Canada. She is also the creator of Awesome Dogs Shareables, an educational meme site providing resources and training tips in small, shareable formats.